Yep, Altaria managed to make the list at #2. And probably for exactly the reasons you think it did. Altaria is a Stage 1 Dragon Pokemon, 80 HP, with a Fairy Weakness, no Resistance, and a Retreat Cost of 1. Pierce is a vanilla 2-for-20 strike that is completely terrible and not at all the reason Altaria made the list. Fight Song is an Ability that gives all your Dragon Pokemon the ability to deal 20 more damage to the opponent’s Active Pokemon and is entirely the reason Altaria made the list. Generally speaking, this is a buffed version of the Altaria from Dragons Exalted, who shared the Fight Song Ability but had less HP and an attack that required mixed Energies, whereas this Altaria doesn’t. Granted, again, you’re not using Altaria for its attack – you’re using it for its effect! And considering that that’s an extra 20 damage per Altaria, this is one of the best combinations with Lance <Prism> to have! Pull out two of these straight from your deck, and you get to deal an extra 40 damage with your Dragon Pokemon! Altaria itself though is extremely vulnerable; even with the extra 10 HP, Altaria is immediately going to be a huge target for your opponent, as 80 HP is on the low side for a Stage 1 Pokemon. Your best bet is to combine it with something like Flygon to protect it from different effects or with Sky Pillar to keep damage from hurting it while it’s on your Bench. In fact, Sky Pillar is probably the best card to protect Altaria; no effects or damage can hit the Bench, but you don’t need to worry about that since you’re gearing up to hit the Active Pokemon hard! If you get Guzma’d though, that’s a tough break. Needless to say, for any Dragon-themed deck, Altaria’s going to play a big role in the line-up. For everyone else…uhhhh…good luck. Arora Notealus: Altaria definitely has a spot in Dragon decks, and it’s likely we’ll be seeing a few pop up surrounding her. Unlike in the Dragons Exalted days though, where the best Dragon-Type Pokemon didn’t really need Altaria that much, there are a few Dragons that nowadays do benefit from the damage boost. One such Dragon includes Altaria-GX, whose attacks with Fight Song become a little bit better! Next Time: Rounding out the Top 5 is the best girl for all your dragon needs! Maybe it came out in a time where pre-errata Pokemon Catcher was preying in pretty much whether support Pokemon that it sees. With 70 HP, it was an easy KO, and even more so as a Swablu with 40 HP that is weak to Lightning; a puny Emolga that has Call for Family can go for the OHKO with Static Shock instead! Maybe it was taking deck space just trying to fit however many evolutionary lines of Altaria that you can spare. That Garchomp/Altaria Deck might have sparked some interest as one of the few decks that don’t use EX Pokémon, but that leaves very little room for other tricks, making the deck linear. Well, times have changed, and fortunately for both cards (this one and the Dragons Exalted print), you have some cards that can summon Altaria without ever needing a Swablu. Dragonite-GX and Lance Prism Star has ways of summoning them. Dragonite’s Dragonporter GX attack fetches three dragon Pokémon from the discard into your Bench while Lance fetches two dragon Pokémon from ththe deck into your Bench. That still doesn’t fix the problem of being a fragile 80 HP Pokemon, and even though Catcher related item cards aren’t too frequent, Guzma and Lysandre are almost guaranteed to happen, but they’re Supporter cards. Pokemon Catcher was downgraded to needing a heads coin flip to work. Counter Catcher can annoy you if you take the lead. That will soon change, however, as the upcoming Custom Catcher will reliably drag any Pokemon in front for an easy KO…if you played two of them at the same time. Due to the new Catcher card coming out, it is best to enjoy using Altaria as much as you can, as pretty soon nothing in the Bench is safe and it’s days of supporting other Pokémon are numbered. Conclusion: Players would rejoice about having a recycled ability back in Standard while in Expanded, it totally makes the older Altaria card obsolete. With that, let me try to imitate Otaku’s conclusion (I couldn’t resist doing this after reading older reviews). Altaria has an amazing Ability on a fragile frame with a poor attack, and with Dragonite-GX and Lance Prism Star providing ways to get dragon Pokémon in play, you actually save deck space by not including Swablu. If you can make a deck that takes advantage of the boost Altaria provides, then you enable certain dragon attackers to dish out heavy damage for very few energy that can potentially land OHKOs or 2HKOs for easy prizes until you eventually win. 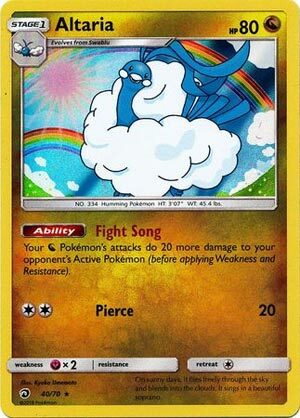 Altaria (DRM 40) swoops into the meta filled with rainbows and sunshine and happiness for all Dragon Pokemon because of its ability Fight Song which increases damage done to your opponent’s active Pokemon by your Dragon Pokemon by twenty points. Moreover, the wording of this ability is exactly the same as the wording for Lurantis (SM25), so Fight Song will stack. We know how much Diancie Prism did for the Fighting archetype over the last three months of the previous format. I own three Lurantis Promos and have used them in various builds. Altaria will be good for Dragon Pokemon. Essential? Not sure about that but was Diancie essential for Buzz? No, but it helped a lot. Altaria boosts a lot of key attacks of Dragon Pokemon: Dragonite’s Dragon Claw does 120 with a single Altaria in play and a Choice Band – for a single Lightning energy. Garchomp’s Royal Blades KO’s everything in the format with a Choice Band and one Altaria out. I will say this: I’m not sure that Rayquaza GX needs a damage spiff of twenty on every attack, and Ultra Necrozma GX is better served with another Malamar on the bench. However, for most other Dragon Pokemon, an Altaria or two hanging out behind the active on the bench for support could be the difference between a two hit KO and an OHKO. Dragon types are getting a lot of help out of this set (obviously they named it Dragon Majesty for a reason), but they still have funky attack costs and have no freebie games because nothing is weak to them. Altaria is definitely an incentive to play decks with Dragon Pokemon as the featured attacker, however, and I look forward to trying this out… whenever they become reasonably priced on PTCGO! Altaria (Dragon Majesty 40/70) is our pick for the second best card of the new mini-set, only available by purchasing products (like giftsets) that contain them: no individual boosters, no booster boxes. Altaria is a Stage 1 [N] Type with 80 HP, [Y] Weakness, no Resistance, Retreat Cost [C], an Ability and an attack. The Ability is “Fight Song”, good for +20 damage to the attacks of your [N] Pokémon BEFORE Weakness/Resistance, but when damaging your opponent’s Active Pokémon. For [CC] Altaria can use “Pierce” to do 20 damage; if its Ability is working, this would become 40 damage. Being a Stage 1 usually isn’t bad. 80 HP means it is an all-but-guaranteed OHKO if it is Active, and means it isn’t all that safe on your Bench, either. Altaria cannot even easily retreat but… +20 damage. Except, but given how Lurantis (SM – Black Star Promos SM25) has never managed to “make” a competitive deck, that might be too much even for a Bench-sitter with an Ability that stacks. …and there are so many [N] Types that could use the damage boost. Even a single +20 helps some borderline examples. Maybe decks could risk running a 1-1 or 2-2 line of it. Maybe some deck or decks will actually go for the full 4-4 line. Altaria also looks like a decent pick (or picks) for Lance [Prism Star] to Bench directly. In Expanded, it should replace the older Altaria, not that I recall any decks using that older Altaria. I’m not sure if you can actually hold a sanctioned Limited Format event using this set, and even an unsanctioned one sounds pricey and awkward given how these packs are not available in the usual way. If you do, then Altaria is likely great for any deck that runs at least a few solid [N] Type attackers… solid by Limited Standards.